Maximum claim of RM100, 000 per company per year. Company participating with booth size which is at least double the standard booth size stipulated by the organizer are eligible to claim an additional RM5,000. Cost of return economy class airfare ticket for one person. 50% of accommodation cost for one person, subject to a maximum claim of RM500 per night. Claims are limited to participation in four (4) international trade exhibitions per company per year. 50% of costs incurred in attaining product certification, for a product not previously certified, including the costs of tests leading to the certification, subject to a maximum claim of RM30,000 per company per year. Expenses incurred for tests which failed to meet the requirements for certification are not claimable. The certification body has to be accredited to ISO/IEC Guide 65 or any bona fide body authorized for product certification mandatory to the export market. One-time payment of RM1,000 to each participating company. 50% of testing cost for dry rubber and latex compound subject to a maximum claim of RM5, 000 per company per year. The testing laboratories must be accredited to ISO 17025. A matching grant for the purchase of eligible testing equipment approved by MREPC subject to a maximum of RM50,000 per company. Open to SMEs and non-SMEs. Companies which have received incentive payment for SBIM16 in 2013, are eligible to claim for one time matching grant subject to a maximum of RM30, 000 per company. For industry- specific testing equipment which are not listed above, companies are required to write in to MREPC Incentive Committee for consideration. Only equipment with the value of RM5,000 and above (per unit) are eligible for incentive. A matching grant of 50% for new and renewal of product registration fee subject to a maximum of RM20,000 per company per year. 50% of expenditure to produce promotional material(s), subject to a maximum claim of RM10,000 per company per year. 50% of first time development cost or one time upgrading cost of company website, subject to maximum claim of RM 5,000 per company. 50% of costs incurred in successfully registering brand names in international markets, subject to a maximum of RM50,000 per company. Matching grant (50%) of registration fee with any e-commerce platform up to a maximum of RM10,000 per year for 3 consecutive years. (First time registration and subsequent two renewals). Claims submitted for the HRDF or any other agencies' training grants are not eligible for SBIM14. 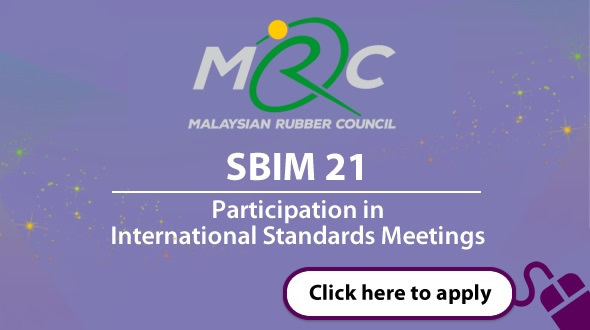 A fund amount of RM100,000 per year to assist selected delegates to represent Malaysia at international standards meetings relating to cessable rubber products. 50% of accommodation cost subject to a maximum of RM500 per night for the duration of the meeting. Malaysia's delegates in international standard meetings will be coordinated by the Malaysian Rubber Board (MRB). Does MREPC provide incentives to exporters only? Can a company participate in tradeshows organised by MATRADE and claim MREPC incentives? Can a company apply for both MREPC and Matrade's incentives for the same activity? "We are a Malaysian registered company that manufactures rubber products. Our company is 100% owned by Japanese. Are we eligible to claim for the incentives?" How long will it take for the incentive application to be approved? When should a company send in their pre-approval form? What are the documents required for claims application? What is the exchange rate used for the purposes of making claims? What is the requirement for rubber glove exporters to apply for MREPC incentives? Can a company display non rubber products together with the range of their rubber products during exhibition? What is pre-determined grant by region? Is there a limit for number of claims under the SBIM1 (Incentive for Participation in MREPC-coordinated international trade exhibitions)? Under the SBIM2 incentives, what is the total amount claimable per year? Can a company choose to participate in 8 trade shows in any one specific region? If a company has claimed up to RM98k, what happens to the balance 2k (as the maximum amount claimable under SBIM2 is RM100,000)? "Our company will be participating in an international trade exhibition on our own. The payment to the fair organizer will be remitted by our marketing subsidiary in Singapore. Are we eligible to claim for international trade exhibition participation?" Can companies engage in meetings with clients outside the fair-ground while participating in MREPC-led trade exhibitions? What is ISO Guide 65? Does the certification body have to be accredited to ISO/IEC Guide 65 only? 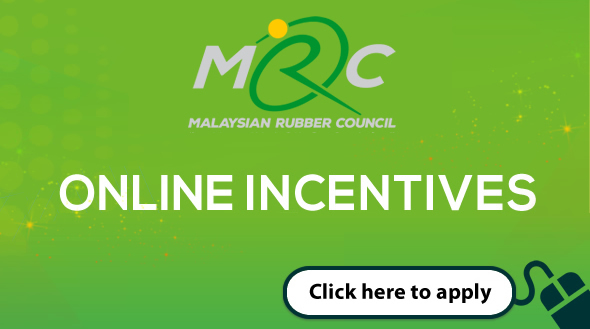 Does MREPC covers ALL expenses leading to rubber product certification under SBIM4 (Incentive for Attainment of Internationally Recognised Product Certification)? 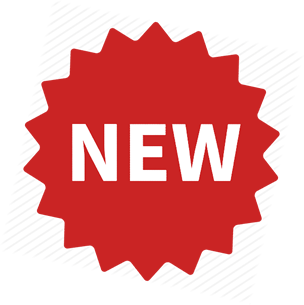 Is government mandatory product certification requirement claimable under SBIM4? What is ISO17025 accreditation? If our company's lab will be audited and assessed by United Kingdom Accreditation Service (UKAS), are we eligible to claim under SBIM7 (Incentive for Accreditation of Laboratories)? Are mandatory taxes claimable under MREPC incentives? What does it mean by "...accommodation cost, subject to a maximum of RM500 per night..."? Under SBIM11 (Management System Certification), will MREPC cover the consultation, training and audit cost upon attainment of the certification? 1. Does MREPC provide incentives to exporters only? The objective of the incentives is to encourage and assist both rubber product manufacturers and traders, who are exporting and contributing to the rubber product export cess, in undertaking capacity building, business growth and promotional activities for the development of export market. 2. Can a company participate in tradeshows organised by MATRADE and claim MREPC incentives? incentives for the same activity? 3. Can a company apply for both MREPC and Matrade's incentives for the same activity? No. A company may claim only from one agency. Submitting a double claim is a serious offence and by doing so companies risk being blacklisted from MREPC incentives. 4. "We are a Malaysian registered company that manufactures rubber products. Our company is 100% owned by Japanese. Are we eligible to claim for the incentives?" Manufacturers and/or traders/exporters of rubber products contributing to rubber product export cess. 5. How long will it take for the incentive application to be approved? Approval of the application will take approximately three weeks, provided all documents are in order. Incomplete documents will not be processed, hence it is the onus of companies to ensure all required documents are submitted accordingly within the stipulated deadline (not later than two (2) months after the completion of the event/activity). 6. When should a company send in their pre-approval form? Pre-approval form should be submitted to MREPC for written approval not later than 1 month prior the event / activity. 7. What are the documents required for claims application? Duplicate copies are accepted if these documents are certified by external auditor, commissioner of oath, chartered accountants and computer-generated receipts MUST BE endorsed and certified by the company that issued the receipts. For SBIM1 & SBIM2 applications, boarding pass and colour photographs of booth (with clear booth no, company name & employee managing the booth) is a must. 8. What is the exchange rate used for the purposes of making claims? MREPC uses the official exchange rate published by Accountant's General Department for the month of the trade exhibition, irrespective of date of payment or claim. 9. What is the requirement for rubber glove exporters to apply for MREPC incentives? Gloves exporters are required to possess a valid Glove Export Licence issued under the same company name applying for MREPC incentives during the activity period. Timely submission of export data through Glove Registration Exercise (GRE) online is also a requirement for glove exporters to be eligible for MREPC Incentives. 10. Can a company display non rubber products together with the range of their rubber products during exhibition? No.All products displayed during trade exhibitions must be cessable rubber products. 11. What is pre-determined grant by region? 12. Is there a limit for number of claims under the SBIM1 (Incentive for Participation in MREPC-coordinated international trade exhibitions)? No. Companies are eligible to apply for SBIM1 incentive for all MREPC-coordinated international trade exhibitions. 13. Under the SBIM2 incentives, what is the total amount claimable per year? Under SBIM2 incentives, companies are eligible to claim for a maximum of RM100, 000, limited to 8 exhibitions per year. 14. Can a company choose to participate in 8 trade shows in any one specific region? Yes provided the claims do not exceed RM100,000. 15. If a company has claimed up to RM98k, what happens to the balance 2k (as the maximum amount claimable under SBIM2 is RM100,000)? 16. "Our company will be participating in an international trade exhibition on our own. The payment to the fair organizer will be remitted by our marketing subsidiary in Singapore. Are we eligible to claim for international trade exhibition participation?" Companies participating in international trade exhibitions on their own may claim under SBIM2 incentive package provided that fascia board, name listed in the exhibition directory and, original invoices and receipts are issued to the Malaysian registered company. If the invoice was addressed to the subsidiary company, it has to be re-invoiced to the Malaysian company. Proof of payment made by the Malaysian company is a must in order to be eligible for the claim. 17. Can companies engage in meetings with clients outside the fair-ground while participating in MREPC-led trade exhibitions? Companies are encouraged to conduct business meetings at their booth during the trade exhibitions. If this option is not feasible, the company has to ensure at least one representative is around to man the booth at all time. 18. What is ISO Guide 65? 19. Does the certification body have to be accredited to ISO/IEC Guide 65 only? To assist the rubber manufacturers in obtaining certification based on their product specifications and/or international market requirements, a Malaysian rubber manufacturer can apply through a certification body which is accredited to ISO/IEC Guide 65 or any bona fide body authorized for product certification mandatory to the export market. 20. What is product certification? that it complies with a set of regulations governing quality and minimum performance requirements. The attainment of product certification attests that the product meets quality requirements of the specified standard or specification. It provides the consumer an assurance of performance, safety and reliability. It also demonstrates that the manufacturer has an effective system for managing its production processes. Attaining product certification is voluntary for most products. However, government regulatory authorities may require mandatory certification for certain products. 21. Does MREPC covers ALL expenses leading to rubber product certification under SBIM4 (Incentive for Attainment of Internationally Recognised Product Certification)? MREPC covers only the expenses of the FINAL test that passed and fulfilled the requirements for certification only. Test results which failed to meet the requirements for certification are not claimable. 22. Is government mandatory product certification requirement claimable under SBIM4? Government mandatory product certification requirement for market entry such as CE Mark and CCC Mark may be considered under SBIM4 incentive. 23. What is ISO17025 accreditation? If our company's lab will be audited and assessed by United Kingdom Accreditation Service (UKAS), are we eligible to claim under SBIM7 (Incentive for Accreditation of Laboratories)? ISO 17025 is an International Standard (published by the International Organization for Standardization) that specifies the general requirements for the competence to carry out tests and/or calibrations in laboratories. It contains 15 management requirements and 10 technical requirements which outline what a laboratory must do to become accredited. A company may secure the services from any body that assesses and accredits laboratories in accordance with the requirements of BS EN ISO/IEC 17025. 24. Are mandatory taxes claimable under MREPC incentives? Value-added tax (VAT) and goods and services tax (GST) are claimable only for accommodation. 25. What does it mean by "...accommodation cost, subject to a maximum of RM500 per night..."? Companies participating in MREPC-organised marketing missions/specialised missions/working visits may claim for accommodation cost, up to a maximum of RM500 per night for one person for the duration of the activity plus one night before and one night after. 26. Under SBIM11 (Management System Certification), will MREPC cover the consultation, training and audit cost upon attainment of the certification? MREPC will only cover the audit cost upon successfully attaining the certification excluding the consultation and training cost.